I wrote to Dale today & told him I was sorry. I am, too. Him & Donald W. are getting to be pretty good friends. B.B. game at Atlanta tonite, but I didn’t go. Got our class rings today. Today is presidental election. Told Dale she was sorry . . . for what? I believe there’s some things she’s not telling her Dear Old Diary . . . did they really break up? She never said so for real. She really never said what happened, but they have stopped seeing each other for some reason . . . another thing she never revealed. Oh, the mystery . . .
On this particular Presidential Election Day, Dwight D. Eisenhower defeated Adlai Stevenson in a landslide for the presidency, taking the place of Harry S. Truman. Eisenhower’s running mate was Richard Nixon. Stayed home tonite & studied. Tomorrow nite a B.B. game with New Cambria Ethel at Callao. The new drive-in is open at Macon. Dale says we are going sometime. Good. We are also going skating, too. Wow! She stayed home one night! Amazing! But she’s still busy laying plans for other nights to go out. Skating would be fun, and Dale is an excellent skater. But he also wants to take her to the new Drive-In . . . hmmm . . .
Macon’s modern new drive-in theater located one-fourth mile south of the Lions Field on Highway 63 will open Wednesday, H.P. and O.M. Arnold, owners, announced today. The theater has a 400-car capacity plus an observation deck that will seat 150 people and a paved patio for 50 persons. The observation deck is situated above the projection booth. A modern double self-service “snackshack” will contain cold drinks, sandwiches, hot coffee, and other confections. The stand is completely finished in knotty pine. A selection of current shows have been booked for the entire month, the owners said. Every Tuesday night will be “Buck Night” at which an entire carload of people will be admitted for one dollar. The theater is now complete except for the landscaping which will be finished this fall and next spring. I have attended movies at that drive-in. I was never on the observation deck, and did not know it even existed. Perhaps it was closed by that time. I do know the price went up — carloads were admitted on Sunday nights for $5 by the time the drive-in closed. The patio was still there, and the snackshack, and a playground had been added for kids. This very same drive-in was open until 2004, when a tornado ripped through the area and knocked down the screen. I believe it was still owned by the Arnold family at the time, although I couldn’t find any information to back that up. The damage was deemed too much to be worth repairing, so an icon of the town is now gone. Krogers store burnt real early this morn at Macon. Harvey Smith has cancer in his legs. Shirley requested a song on KNCM for me today. Got a letter from Minnie today. I hurt my knee. I don’t know who Harvey Smith is. I’ll have to ask Opal if he’s any kin of hers, since she’s a Smith. There was nothing in the papers about him. It was nice of Shirley to request a song for Hazel. Probably did that for her birthday. I wonder how she hurt her knee — playing basketball, maybe? A fire of undetermined origin swept through the Macon Kroger store at Rubey & Vine Streets early this morning, causing an estimated $100,000 damage. The building and merchandise are a total loss, according to L. Z. Barnes, district manager , of Kirksville. The blaze was discovered about 2:50 a.m. by C. M. Johnson, a truck driver from Kansas City who was delivering an order to the store at the time. Macon firemen fought the blaze for 2 1/2 hours, but were hindered in their attempts to get at the fire by a tin roof, which had to be cut through before anything effective could be done. Tonite was last night of Homecoming. Yvonne J. was the queen. Mary Ann & I rode the Rock-o-plane 2 times. She met Donald Wilt & talked to him for an hour or 2. Dale wasn’t there but I saw Anita J., Tooter, & Ronnie W.
No more Homecoming with Dale. She had to ride the Rock-o-Plane with Mary Ann instead. Entertainment on this last night of the Homecoming included, of course, Sky Man in their two scheduled performances, but also yet another band concert, more tap dancing, vocal and accordion performances, and the crowning of the 1952 Homecoming Queen. Hazel’s cousin, Yvonne, won the crown this year. Dale came up tonite & we went to Homecoming. Won a bunch of dishes & stuff. We took his folks & Patti home, then we came back & rode the rock-o-plane & ferris wheel (Oh!) Then he brought me home. He brought me an autograph bk. from Okla. I love it. Me, & Maureen played tennis at Macon today. Busy fun day! And Dale finally made it up to take her to the Homecoming. And he brought a gift. If you look closely at the header for the blog, you can see, in the middle of the photo, a little rust-colored book (the one with the small pictures laying against it). That’s the autograph book he brought her. She seems to be very impressed with her ride on the ferris wheel with Dale — hmm . . . wonder why? Think they got stopped at the top and had a “moment”? I’m sure her mind was nowhere near what was on the program tonight. This evening’s entertainment consisted of a band concert, tap dancing, baton twirling, vocal and piano performances, square dancing, and again: Sky Man! Grandma & Mick, Maureen, & Jerry came in today about 3:30. We went to homecoming tonite. I talked to Damon & Anita J., but Dale wasn’t there. It’s real chilly tonite. I’m kinda ½ way mad, Not really. Company in town for the Homecoming . . . but they missed the parade! Damon is there with a date, but Dale is a no-show, and it seems to have ticked Hazel off a tidget, although she won’t completely admit it. Smart, actually, because why would he want to blow all his money on her the very first night? Being cool, playing it safe, don’t want to appear too eager, now, do we? Today is the kick-off of the 19th Annual Bevier Homecoming. It began with the big Parade at 1:30. The evening’s entertainment included a band concert, vocal and accordion selections, baton twirling, a Girls Revue, and . . . Sky Man! 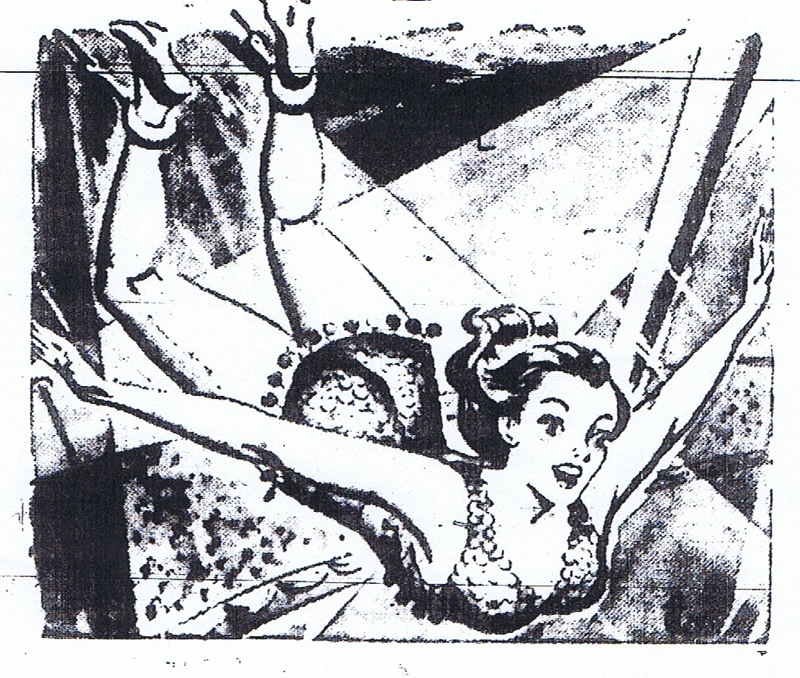 Note in the illustration for their ad that the happily flying girl is tethered by her ankles whilst flying above the crowd. I had completely forgotten that when we were very little, the Homecoming used to book acts such as this every year. Boy, the memories this brought back! I can remember watching the performers walk the high-wire, and seeing trapeze artists swinging above the crowd. I was amazed! As we got older, (and this makes me feel really old) they quit booking these types of acts, and now they always book only country music acts. They also don’t have nearly the amount of local talent on the program, either, and some say that’s a good thing! Things sure have changed. Peg is staying all nite with me tonite, cause it stormed & Vern & Jo had to walk home. Mom got at permanent at Lucilles Beauty Shoppe today after work. I’m wearing my hair in a new way. I’m guessing that Lucille’s is a salon in Macon. Mildred’s trip to said salon seems to have inspired Hazel to change her own hair-do as well. I’m trying to figure out why a storm would cause Vern and Jo to have to walk home. Maybe the creek got over the road, maybe their car wouldn’t start, maybe . . . what? I can’t figure that one out. At least they didn’t make poor Peggy walk it with them. It’s at least a 2-mile walk, maybe more, even through the country. And I, for one, wouldn’t have wanted to walk during the storm, but surely they waited until the worst was over . . . baffling all around. Bevier must have been on one edge of a huge terrible storm system that went through, because that same night, a tornado ripped through the State Fair in Sedalia, Missouri, killing 1 person, injuring 17 others, and doing about $3 million in damage to the Fairgrounds and its buildings. The storm hosted 78 mph winds and caused the heaviest destruction Sedalia had seen in 25 years. It closed the Fair down for a few days so they could take time to recover. I was reading this from old 1952 newspapers last Thursday afternoon. Thursday night, a storm system went through. Worse to the west and south of us, and we were right on the edge of it. Friday, I got up, got ready, picked up my cousin, and drove to the State Fair. It was closed! They had had 95 mph winds when the storm went through, and it had knocked out power to over 60% of the entire city, including the fair, and had done quite a bit of damage, although thankfully, no one was injured this time. Cleanup was still in progress before they could let anyone in, and they had no estimated time as to when that would happen. So we had to turn around and come back home without seeing the fair. Very ironic, how history repeated itself in this particular instance. If you want liver to go through a food chopper easily, cover the liver with boiling water and let stand about 10 minutes before grinding.